Adulting. It’s a thing apparently. And whether we feel like it or not once we get to a certain stage in life we’re deemed grown ups and old enough to do all the things that come with the territory. Sure it’s a lot of fun- I can eat too much ice cream, buy whatever shoes I want, and pursue a career I love- but it’s also busy. I don’t know how many times in a day I joke about coffee and wine (couldn’t adult without them!) and I appreciate coffee even more when it’s hot. This is why I really took the time to select the right coffee machine before committing to buying it. I went to Product Expert to read some of the helpful reviews available. And thankfully there’s plenty of options to choose from with a growing selection for busy days when you’re running from one place to the next to the next without a lot of time. When I was a kid Mac’s Convenience Stores were the corner store you went to after school, after practice, or ‘just because’ to stock up on 5 cent candies and they’re stepping up their coffee game to make getting that perfect cup of coffee a little easier and faster- perfect for busy grown ups (but I still love my 5 cent candies! 😉 ). They are now offering gourmet selections with their Simply Great Coffee machines available at locations throughout Western Canada with popular choices such as lattes, mochacinos, and dark roast coffee- perfect if you’re stopping to pick up a snack on the go, popping in with the kids, or just don’t want to drop five bucks for a good cup of coffee. If you like trying new things and want to give the new Simply Great Coffee a try, I’ve got some coupons for free coffee to giveaway- enter below for 1 of 5 sets of coupons to try the new Simply Great Coffee (all of the barista- style drinks such as lattes) and Premium coffee (drip coffee available in medium and dark roast). So the next time you’re craving a good cup of coffee, skip the drive through and pop into your local Mac’s to try their new varieties. You save a few bucks and get a good cup of coffee on the go (plus maybe a few candies to reward yourself while you’re at it!). Win- win. Enter below! To see how the Simply Great Coffee barista machines work, see this video for more. Disclosure: I was provided with product and compensation for this post. All opinions and content are my own. Enter below to win free coffee from Mac’s Convenience Stores! Back in November & December I went off coffee for a month. Before you say it, I know what you’re thinking: Why would you do that to yourself?! You’re crazy! I definitely heard that plenty of times over those four weeks, along with ‘so how’s that going for you?’. And as hard as it was to give up my morning cup of caffeine- or 2 or 3- I knew I had to give it a try. If you’re like me, your morning cup of coffee is like an extension of your arm- it’s a part of you, you can’t live without it. You start the day off with a cup of coffee and end it with a glass of wine, amiright? 😉 I have a friend to starts her day off with a cupCBD coffee as a way to calm herself and as a peaceful way to begin her day. But I was noticing something felt off- I was anxious, high- strung, and getting stressed out way too easily (don’t get me wrong, I’m a type- A, so I tend to be like this, and like to stay busy, but I was starting to feel like it was getting the better of me). So I made myself an appointment with our family naturopath (the same lovely, amazing woman who has helped us so much with Ari’s health) and knew there was a good chance I’d be saying adios to coffee for a while. It’s no secret caffeine can cause or worsen anxiety, so I thought it would be pretty high on the list of things to go. There were a few other things discussed, including diet, but going coffee- free for a one- month trial was the main factor we discussed (and just for the record, my Doctor kindly mentioned that alcohol is no friend if you face anxiety). I just wasn’t willing to face a month without both- there’s only so much sanity- testing you can try at once- especially when you have kids! ;). I was curious to see how it would impact me; coffee is a part of my morning ritual, and aside from that, I genuinely enjoy coffee, especially on those rare days I get to drink it hot. It’s how I’ve started my day for over a decade, so going a month without the stuff was an interesting idea that had me making pots of decaf after Will had his morning cup (luckily it was getting close to Christmas, so I added eggnog to make it taste better). 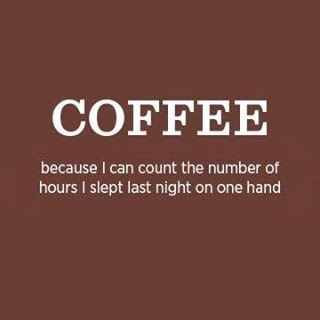 My problem was always the morning question I’d ask myself: “how much coffee per cup?“. Each morning, I’d put more and more coffee in the cup, seeking that immediate buzzing thrill you always get. But really, do we drink coffee because we need to or because we tells ourselves that we can’t face the day without a cup? I know people who quit drinking coffee, and they not only function (hey, some days that feels like an achievement! ), but they swear it’s the best thing they’ve ever done. I’m not out to bash coffee here (and spoiler alert, yes I went right back to it after the month was up, but more on that later), but this was definitely an interesting experience and I thought I’d share about it. I know I’m not the only one who faces anxiety, and finding ways to help doesn’t have to be complicated, you just have to be willing to give them a try. If you’re curious, trying a ‘coffee cleanse’ might be something that helps you too, so I made notes throughout the month of how I felt and the differences I began to notice. Even if you don’t nix coffee for a month, I hope this gives you something to think about when it comes to your own health and well being. Day 1- Headache and so LETHARGIC/ no energy. Took a nap and noticed I’m definitely edgy. Surprised how much not having a cup of coffee in the morning affected me, even if it was just a psychological boost to get the day started. Day 2- Second day with a headache. Energy not great, but feeling better than yesterday. Made myself decaf and realized how much I do genuinely like/ enjoy coffee. Had McDonalds for lunch as my ‘poor me’ reward for voluntarily opting to nix coffee for a month. 28 days to go… YIPPEE. Day 3- First day without a headache. Energy a little better. Day 7- A friend brought over an Sbux Peppermint Mocha and not going to lie, I had a few sips (soooo good!). I just couldn’t resist. Then I did the nice thing and gave it to Will, but I think stopping myself at just 3 sips still counts as will power, no? Day 8- Officially one week since this thing started. Overall feeling good, but still missing coffee. Had a grown- up tantrum this morning getting ready to head out with the kids and straight up said to Will ‘I’m really missing coffee today’. Poor guy- I think I was nicer when I was pregnant. Picked up a large decaf from Timmies and pretended it was the real thing- pretty much tasted like it was, so I was happy. Good ol’ Canadian girl right here, you can’t beat a good cup from Timmy’s, even if it’s sans caffeine. Day 10- Noticing that I’m not as anxious, don’t feel stressed out/ overwhelmed as easily. Still feeling low- energy and missing the real thing, but definitely noticing a difference. Day 15- Grateful it’s close to the holidays and I can pour eggnog in my decaf. I know some aren’t too bad but the stuff I have tastes like flavoured water and just not the start to the morning I want, so I’m letting myself have this little thing to make it taste better. Day 17- Absolutely can’t deny my anxiety has come waaaaay down. Things that used to get to me don’t bother me as much or as quickly. I’m letting things go and being a little more of the easy going person I like to be. The kids make it tough, not going to lie, but I can’t deny the difference I’m noticing. Day 20- Counting down the days and getting curious to see what it will be like to have coffee again after not drinking it for a while. Decided that I’ll limit myself to one cup a day when this is over and make decaf on days when I notice my anxiety is bad. I’m sure quitting coffee altogether would be best, but I also want to be realistic about this. Day 25- Soooo close to the end. Overall, my energy is ok; it’s not great but I don’t feel as lethargic as I did the first week (admittedly I know other factors like what I’m eating have to do with this as well). Glad I’ve stuck this thing out, even though I’ve been tempted (thanks to Will for encouraging me to keep going, even when he was the target of my grumpiness so many times!). Day 30- LAST DAY!!! Looking forward to my first cup of coffee tomorrow. It’s seriously funny how much I’m looking forward to it. I’ll be stopping at one cup, instead of going back for more like I used to, and see how that works out. If I find my anxiety comes back, I’ll probably make the choice to give up coffee. As much as I love it, it’s not worth me feeling edgy, or the harm that stress and anxiety can do to the body. It’ll be interesting, and I’m hoping I’ve got myself in check these past few weeks to follow through with the goal of limiting myself. I know my friend takes CBD Capsules to help their her anxiety but I feel like that’s a little extreme for me, I’ll just stick to the coffee. After this experience, I can see why caffeine is considered a drug. I absolutely, 100% missed coffee, craved it, and went through withdrawals. It was a weird experience at first. But it also showed me that I really don’t need a cup of coffee (as much as I enjoy it). Noticing the difference in myself over that 30 days was a good reality check on how we can impact ourselves by the diet choices we make- even with something as simple as a morning ritual that we let get excessive. I get it, some days we just need that extra boost, another cup of coffee, or whatever it is to make the day more manageable, and we shouldn’t be hard on ourselves for it. I’ll always be the first to admit that I couldn’t adult without my coffee and wine, and I don’t want to sound preachy. If you’re having a rough morning, absolutely pour another cup. My point is that if you notice it’s starting to do more harm than good, maybe you need to take a step back and think about it, like I had to do. What I’ve done since… For the most part, I’ve stuck to the 1 cup a day rule. There have been a handful of times since when I’ve let myself have more if I’m feeling happy & calm. If it’s a morning where I’m feeling anxious or off, I’ll avoid coffee altogether and opt for decaf instead. I’ve done that several times and have found that I can calm myself down and face whatever the day throws at me much better without the caffeine jolt buzzing my nerves. When I started the 30 days, I talked to Will about how I hoped to moved forward during and after this little test, and that if I had to, I’d give up coffee altogether. He was and is encouraging and understanding; on days when I’ve told him I opted for decaf he cheers on the choice I made to help make the day better. And as insubstantial as a cup of coffee may seem, it’s just one of many choices we can make in a day to help feel and be our best selves. Coffee is still something I enjoy- it really is a little ritual for me- but I treat it differently than I did before.